The amount spent on a 'bongo-drumming' away day by civil servants. They've also whacked £258 on Whitehall credit cards for finger puppets, and £120 for bespoke cakes. Times are tough in the public sector. Between lay-offs, slashed bonuses and rows over pensions and working hours, it's not the most cushy time to be an employee of the Government. To rub salt in the wound, a new report has been issued highlighting the 'profligate' purchases made under the last Government. 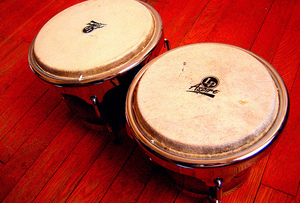 And can anything be more self-indulgent than an afternoon spent bongo drumming, charged to the public purse? Cabinet Office Minister Francis Maude is releasing these tales of Labour luxury while reporting that spending on Whitehall charge cards has been cut by £45m since the Coalition came to power. In terms of anti-Labour spin, it’s pretty impressive. As part of a new era of transparency for the government, the Cabinet Office is set to publish each item of credit-card spending by officials above £500 since April. Should make for an entertaining read. Back to the bongos. The hapless ministers that have been outed for their rhythmic squandering of public funds came from the Communities Department. But they're not the only ones to enjoy a bit of bongo fun. Foreign and Commonwealth Office officials spent £38,636.40 on the same events company from 2006 to last year. Their testimonial on the Poisson Rouge website reads: "Everyone thought the Rhythm Challenge was great fun." Other culprits include: the Department of Health, which spent £258 on Puppets by Post, and £124 on three cake orders from high-end bakery Konditor & Cook.